Albany, N.Y. — The New York State Department of Transportation (NYSDOT) and The Nature Conservancy are piloting the state’s first-ever “critter shelf” for wildlife. Installed this summer inside a large culvert under State Route 12, south of Boonville, in the Black River Valley, the suspended walkway provides a two-foot wide platform for wildlife to scurry through the culvert instead of crossing over the busy road. It is attached to one side of the corrugated steel culvert with brackets and cables. While Route 12 is a vital travel corridor, it can also be a dangerous obstacle for wildlife. 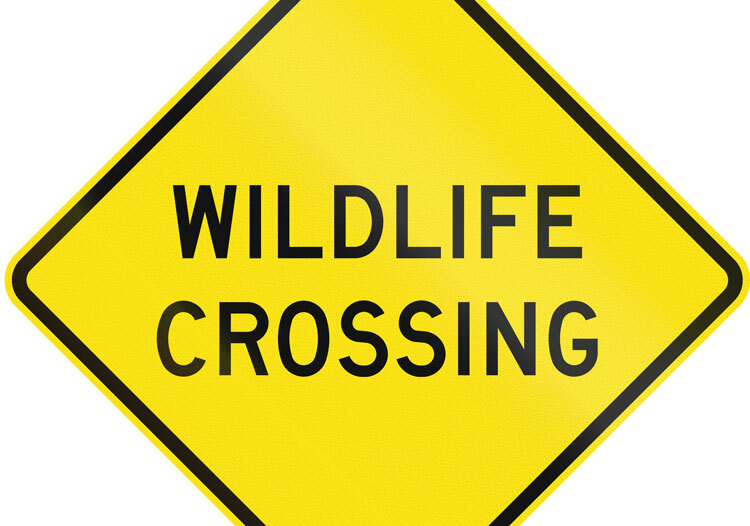 Alternatively, wildlife attempting to cross also pose danger to drivers. The Route 12 culvert carries a stream that averages about three feet in depth under the road. The new shelf sits above water level while not impeding water flow, or compromising structural integrity. At 138 feet, it runs along the full length of the culvert and expands the potential for use by wildlife by providing dry passage for bobcats and other wildlife that don’t swim. The test site was selected based on several factors. Scientists have identified the 650,000-acre Black River Valley — a patchwork of forests, farms, businesses and residential communities — as an important linkage area for wildlife. Enhancing wildlife pathways in this area gives animals a chance to move between the core forests of the Adirondacks and the Tug Hill, which is important for finding food and mates, adapting to climate change, and preventing populations from becoming isolated. Through wildlife tracking and computer models, Route 12 was identified as a significant barrier to wildlife movement. The culvert at this site is in good condition and keeps water away from the road above it. Additionally, it is large, 14.4 feet tall by 13 feet wide, and surrounded by forest cover on both sides, including one side protected by a conservation easement, making it a good, strategic choice. At $28,375 this modification is far less expensive than completely replacing a culvert with a new one designed for wildlife passage. The Nature Conservancy has been using trail cameras, which are activated by motion and heat, to monitor wildlife activity at this site for more than a year prior to the shelf installation. The cameras will stay in place for at least a year to help assess the effectiveness of the new walkway. “In this area, the critter shelf is a low-cost alternative to the massive wildlife overpasses like you see in the Canadian Rockies for elk and other mammals. If it works well here, it could be used in other parts of the Northeast. We really appreciate our DOT partners for finding innovative solutions to mitigate dangers to wildlife while also keeping roads safe for people,” said Alissa Rafferty, Wildlife Connectivity Project Manager with The Nature Conservancy’s Adirondack Chapter. The shelf was shipped to New York from Montana, where that state’s transportation department has found success using the technology. The design, trademarked and patented as CritterCrossing, was developed and tested in Montana by transportation experts, a wildlife biologist, and a steel manufacturer. DOT is working on practices in the Adirondack Park to improve wildlife connectivity and reduce wildlife mortality. This includes targeted turtle fencing adjacent to the highway near Tupper Lake that prevents turtles from crossing over Route 30, adding stream structures at culvert crossings during projects to improve aquatic species passage, updating guidance to inform bridge and culvert project development to potentially enhance opportunities for fish and wildlife passage. The Nature Conservancy and New York State Department of Transportation are both partners of the Staying Connected Initiative, a network of transportation and natural resource agencies, non-profit organizations and others working together to maintain and enhance habitat connectivity for wildlife across an expansive 80-million-acre forested landscape shared by the United States and Canada.